Paolo Veronese (1528–1588), The Feast in the House of Simon the Pharisee (detail) (1570), oil on canvas, 454 x 974 cm, Château de Versailles, Versailles. Wikimedia Commons. Paolo Veronese (1528–1588) was and remains well known for his often huge paintings of feasts featured in the stories of the Christian gospels, about the life and ministry of Jesus Christ. He painted many of these from the late 1550s, mainly to satisfy a market for large paintings to hang in the refectories (eating halls) of monasteries in Italy. At first sight, their narrative may seem simple, and consist of the gospel account of that particular event. However closer examination of their content shows that each contains cues to many other narratives, which appear unrelated to the central story. These appear to be largely confined to painting (and photographic) narratives, and may explain other puzzling paintings such as Poussin’s landscapes. One of the first of these feasts, and possibly dating from 1555, this seems to have been an experiment which succeeded. The painting contains separate passages which cue this narrative: on the far left is an asynchronous ‘flashback’ if you like which refers to the journey to Emmaus. 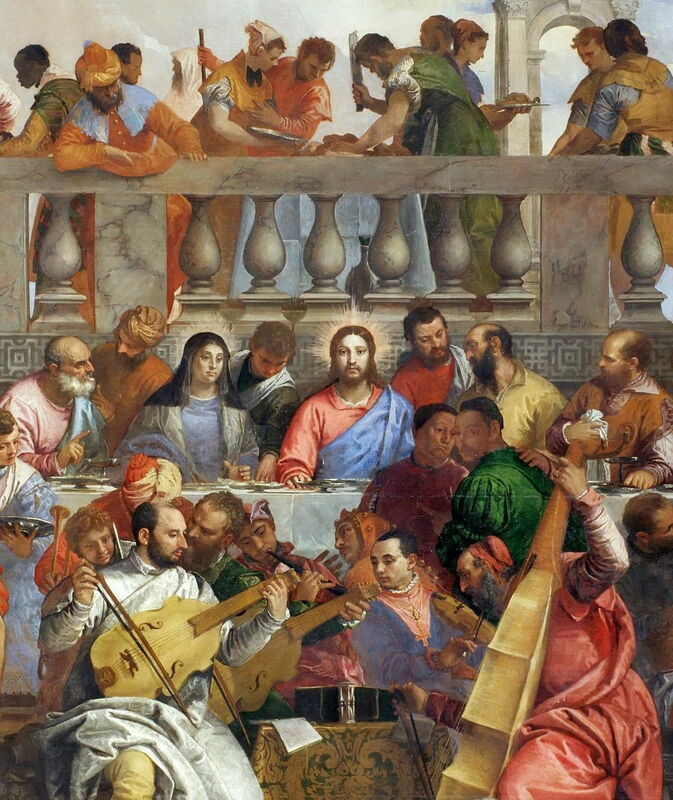 Christ is in the centre of the painting, with a halo to indicate his identity, and is in the midst of breaking bread. With him at the table are the two bearded figures of the disciples, dressed as pilgrims, and bearing staves. On Christ’s right is a servant, acting as waiter to the group. This leaves us to account for the other onlookers: three men, a woman, five boys, four girls, and a baby, together with assorted pet animals. The adults and children are dressed in contemporary costume, rather than the robes of the early first century, and it is that which makes it clear that this is also a family portrait, part of the narrative of the life of an aristocratic Italian family of the day. It is not impossible to intertwine two separate narratives 1500 years apart in a single text or oral story, but unusual and a more conspicuous artifice than this painting is. A few years later, in 1562, Veronese was commissioned to paint a much larger work for the refectory of the Benedictine Monastery of San Giorgio Maggiore in Venice. Its central narrative is another episode of the ministry of Christ as recorded in the gospels. Here, Christ and his disciples were invited to a wedding feast in Cana, Galilee. Towards its end, the wine started to run out, and he was asked what they should do. He directed servants to fill jugs with water, which he then miraculously turned into wine. The huge canvas shows Christ, distinguished by his halo, at the centre of his disciples, with the Virgin Mary (also with halo) at his right, and sundry disciples arrayed along that side of the tables. The wedding group is at the far left of the party. Paolo Veronese (1528–1588), The Marriage Feast at Cana (detail) (1562-3), oil on canvas, 667 × 994 cm, Musée du Louvre, Paris. Wikimedia Commons. At the far right of the canvas, wine is shown being poured from a large container, a clear cue to the gospel narrative. There is also a great deal of other activity, in every part of the painting. On the balcony behind Christ there are scenes of the butchery of meat, which is generally claimed to be lamb and symbolic of Christ’s future death as a sacrifice for mankind, as the ‘Lamb of God’, although there are no visual cues to support that interpretation. In the musicians below, and other guests, it is claimed that there are portraits of artists, including Veronese himself, and Titian. Other important figures which are supposed to be shown include Eleanor of Austria, Francis I of France, Mary I of England, Suleiman the Magnificent, and Emperor Charles V.
Again, Veronese has intertwined the gospel narrative with others, this time multiple snippets referring to other stories. 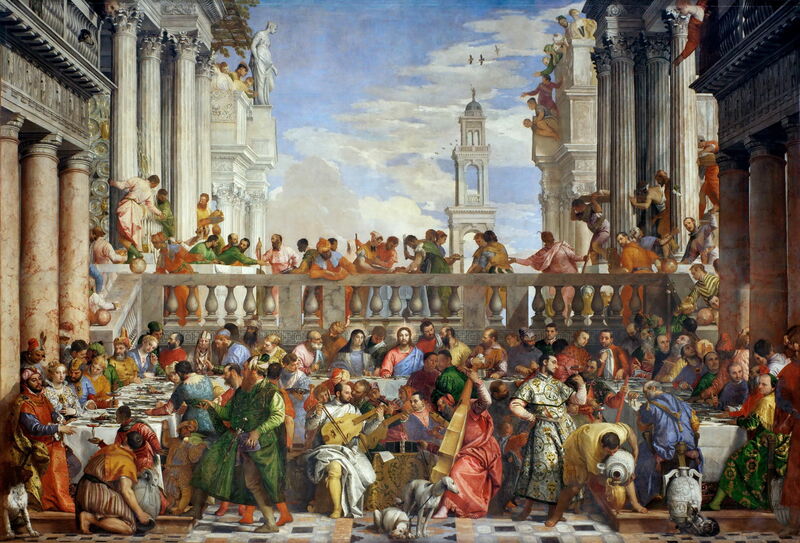 Paolo Veronese (1528–1588), The Feast in the House of Simon the Pharisee (1570), oil on canvas, 454 x 974 cm, Château de Versailles, Versailles. Wikimedia Commons. Veronese painted many more large canvases for refectories. A later and equally spectacular example is this, depicting as its gospel narrative another feast, here in the house of Simon, a Pharisee. According to the gospel of Luke, chapter 7, during this Christ’s feet were anointed by a ‘sinful woman’, and he told the parable of the two debtors. 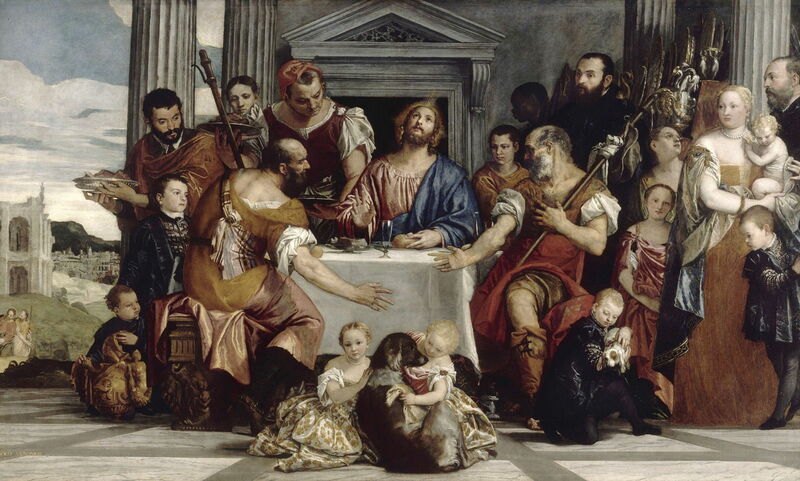 Slightly to the right of centre, Veronese shows Christ, this time without a halo. 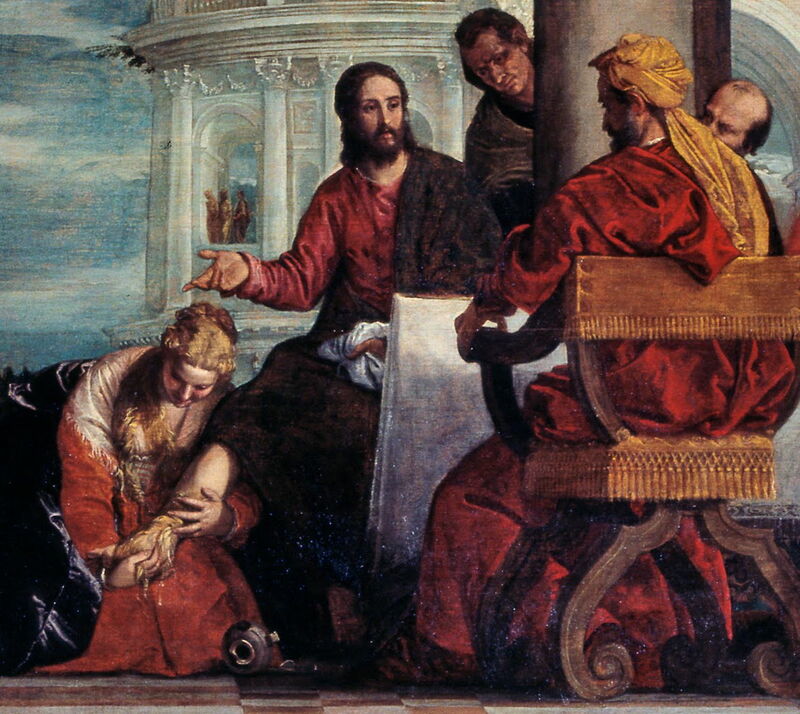 A woman is indeed anointing his right foot, the empty jar of precious ointment discarded in front of her. Sat opposite Christ, and apparently in discussion with him, is the pharisee of the title. Beyond that central group, there are many other events in progress. At the left of the painting is a group in active discussion, of whom several wear anachronistic or inappropriate dress, suggesting that they are from a different time and place. There are similar disparities at the right of the painting too, where the figure at the centre looks to be of contemporary Italian origin. Paolo Veronese (1528–1588), The Feast in the House of Levi (1573), oil on canvas, 555 × 1280 cm, Galleria dell’Accademia, Venice. Wikimedia Commons. An even more massive canvas followed, and took Veronese into danger. This was painted for the refectory of the Dominican Friary of the Basilica di Santi Giovanni e Paolo, and was intended to show the Last Supper, Christ’s last meal with his disciples before he was betrayed and crucified, at which he laid out the sacrament of Communion, a key part of Christian life ever since. However, he over-reached himself, and the painting brought such offence that he was brought before the Inquisition accused of blasphemy. Thankfully the Inquisition did not impose any penalty on Veronese himself, but required that he ‘correct’ the painting within a period of three months. This he did by changing its title, not its content, to The Feast in the House of Levi. Christ is shown in the centre of the painting, further emphasised by his halo. 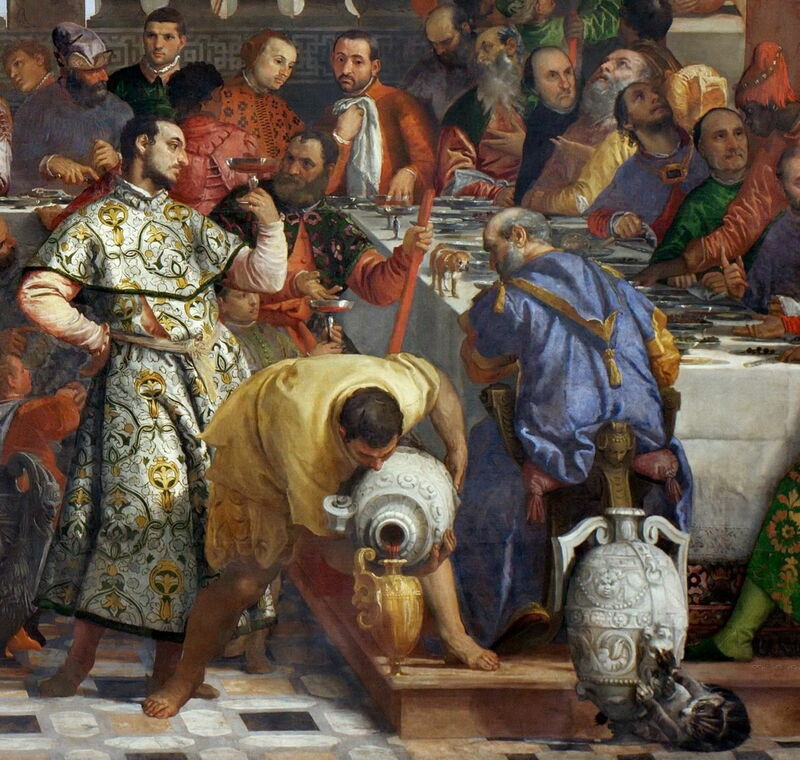 In addition to the standard row of disciples, Veronese adds a rich collection of other figures, described by the Inquisition as “buffoons, drunken Germans, dwarfs and other such scurrilities”, more in the manner of a Venetian feast. We painters use the same license as poets and madmen, and I represented those halberdiers, the one drinking, the other eating at the foot of the stairs, but both ready to do their duty, because it seemed to me suitable and possible that the master of the house, who as I have been told was rich and magnificent, would have such servants. … when I have some space left over in a picture I adorn it with figures of my own invention. … I did it on the supposition that those people were outside the room in which the Supper was taking place. 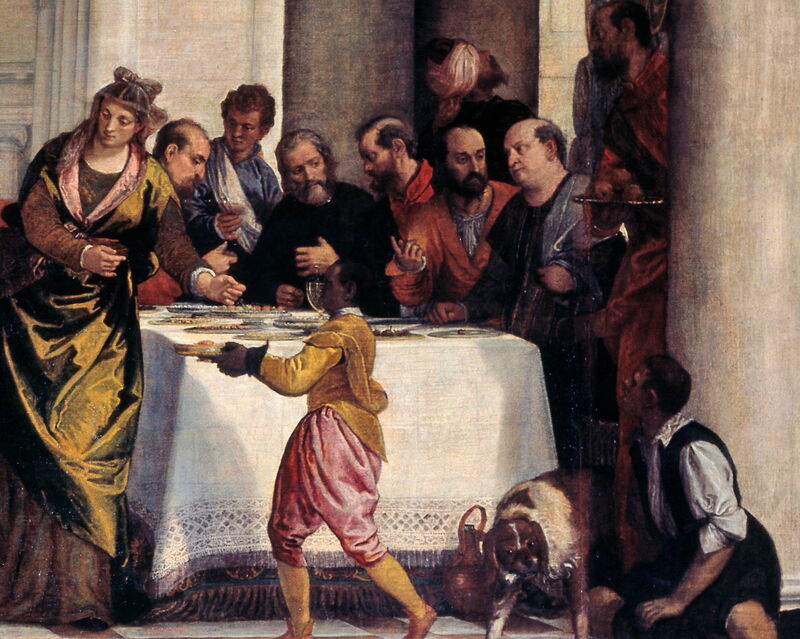 That was not the only painting of the Last Supper which Veronese made for a refectory. This was probably his last, and a small fraction of the size of the previous one of 1573. It is very unconventional, in placing Christ (with the halo) at its far left, and putting the disciples in a disorganised huddle to the right of him. Still there are additions, though. At the far right, in the distant gloom, a couple are seen in discussion, one wearing a turban. Nearer the viewer is a (female) child, a dog, and another figure apparently squatting on the floor. In these five paintings of feasts, Veronese has adorned each central gospel narrative with one or many unrelated additional narratives. Initially the additional story was that of a family portrait, but he subsequently used the technique to fill the “space left over” in his paintings with many other cameo narratives. Most of these would only have been meaningful to his contemporaries, and some were possibly quite private. Non-serial visual narrative is not only suited to this reference to multiple narratives, but many viewers find the result both appealing and fascinating. The Last Supper has been used repeatedly as a platform for this narrative form, and remains a popular image to place on the walls of dining rooms (I have seen this done in an English pub, for instance, with a modern revision of the Last Supper). This approach has extended to illustration, where there are series of popular children’s books based on this narrative form: Where’s Wally and Richard Scarry’s Gold Bug are examples. This works with non-serial narrative, because the viewer can trace the cues for the central and other narratives independently and in their own time; if they fail to recognise additional narratives, they can choose to ignore them or to speculate about them. The consequences of trying this in a serial medium such as a novel, or oral storytelling, would be to confuse the audience, and lose their attention. In painting (and photography) it does just the opposite. Posted in General, Painting and tagged feasts, Last Supper, narrative, painting, Veronese. Bookmark the permalink. Is brevity the soul of the abrupt, rude, and offensive?